I originally tasted this curry recipe when my friend Kristy Benz made it back when we lived together during spring school at Bishop’s [insert nostalgic moment]. It turned out that not only did I own the same cookbook with the recipe for that curry, but I used to be obsessed with it back when I was a pre-teen vegetarian. The thing that is so great about the cookbook is that it has pictures of the dishes, allowing your eyes to decide what looks good. It also has recipes varying in difficulty, making it a really useful book for any cook. It is called The Essential Vegetarian Cookbook, and many of the recipes just so happen to be vegan. My dad had a pot luck at work this past week, and asked me to make a casserole of some sort. I opted for this chickpea curry, and served it on top of a bed of rice, but the recipe claims that it is also delicious inside of a wrap. It could make a good main dish, or a side dish. Also keep in mind that this recipe is saucier than it looks! I chopped the onions into small pieces, and peeled and crushed the garlic. Meanwhile, a pan was heating with the oil in it, and I sauteed the onions and garlic until they were clear and tender. I added all the spices, except for the garam masala, and let the mixture cook for one minute. 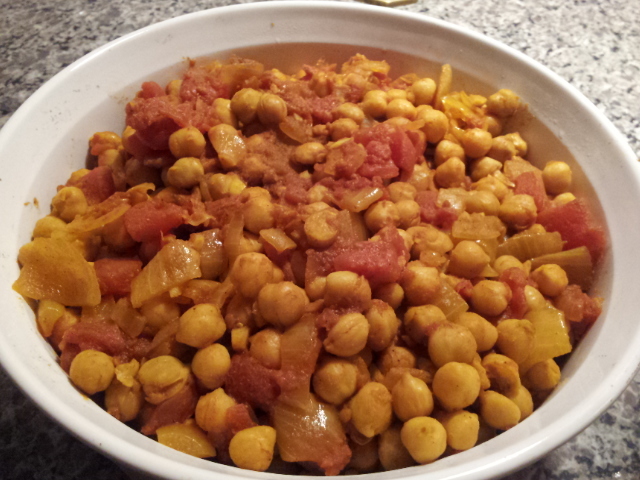 I added the chickpeas and the tomatoes and gave the pot a big stir to combine all the ingredients. Covering the pot, an stirring occasionally, it simmered on low heat for 20 minutes, until the chickpeas were soft. Lastly, I added the garam masala and let the curry cook for another 10 minutes. Pingback: Craving Curry? | The Tromp Queen COOKS!